Emory Buck is a second year medical student at Georgetown University School of Medicine. She received her undergraduate degree in Biology and Spanish from the University of Virginia in 2015. 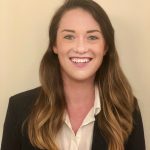 Although she remains undecided about her future specialty, she has been working with her coach, Meredith Betz, to improve her communication and leadership skills and strengthen her personal and professional development.